Home again. I have been in the car it seems for all eternity. Ahhh. I have been away. I am back. It is bliss. I feel as if I have run a marathon. I sit here, feeling excessively tired but peaceful, on my sofa in my sitting room. There was no blog last week, I did not have the time. This is where I long for staff, so that I always have time for the fun things in life, but as yet I have no staff. I have an erratic Giant Boy, some moderately helpful lodgers when they are around (they are always working or asleep or silent in their rooms), and helpful friends. Though as I write the lawn is being mown by the anxious Polish lodger, so for a brief while I am under the illusion that I have staff, and I am very grateful to him. The last time I looked, he was dutifully making nice lines amongst the weeds and dandelions in the grass, and Giant Boy was bouncing on the trampoline. Probably best that way. There are no chauffeurs, housekeepers, admin people, PR managers or bubble bath staff on the books yet. No gardeners, laundry workers, menu planners or pastry cooks in my life but they will come, oh yes, they will come. When the time is right, I will start by interviewing the pastry cooks. They will be asked to make giant pastry swans and small pistachio tarts and I will select the best one by working through the swans and tarts until I have made my decision. And if I can't make a decision, I will employ them all. I woke late this morning after a terrible dream where my friend Olivia was legging it into the distance away from me on a railway platform, and I could only stand still and sway, with trains featuring somehow somewhere - I woke late to find the room spinning around me when I stood up, and wondered if perhaps I was dying. The room was coming up to meet me. If I get to the bathroom, I said to myself, and I am still alive, I am simply over tired and the cure for it is 1. Bed 2. Bed. 3. A Pastry Cook. (to cook, the pastry cook does not leave the kitchen). Oldest Son was 21 this week. It was a low key affair, and we had a jolly breakfast with chocolate croissants, mango and pineapple smoothies, cards and presents. He used to love the Spice Girls so Giant Boy put them on and we remembered how Older Son used to dance to I tell you want I want what I really really want in an orange Spice Girl tee shirt when he was about 3 years old. Then it was time to have a smoke in the garden and get back to being cool and detached. The real partying began when he left to go to London later on in the day, and I think they are still going now. Yeah, well, still Spice Girls fans. Fancy Girl took her tired old Mum to a Dolly Parton concert at the O2 in London. It was as wonderful as you can imagine, and I had an absolute ball. Dolly is in her late sixties and belts around the stage for hours night after night in high heels and I have come away more amazed that she is not tired and I am, than with her spangly sequinned shorts and tops. I expect Dolly has about three pastry cooks. I spent yesterday with Eileen in her flat as she prepared to leave it for three years. She has moved to Tanzania to work over there for HMRC. I got, as you read above, the flat screen telly and she doesn't know this, but all the veggie sausages in her freezer. We went to Heathrow in a taxi, and when we said goodbye we both cried. That surprised us both, and I have been feeling very lonely ever since. I had to get back to her flat in Norbury to collect my car, and check a few things for her. It was then that I found the freezer full of Linda McCartney veggie sausages and decided that every cloud has a silver lining. It was all a bit sad, so here is the Departure Gate behind which Eileen has gone to Dar Es Salaam and I went back to Bognor without her. I am going back to bed (without a pastry cook working on any pastry for me in the kitchen) now, so that tomorrow I can focus in the studio. I do have a new portrait to do, and I have been thinking about something new for AGD too. The idea is so unformed that I will let it make a bit more sense before putting it down for you all to see. 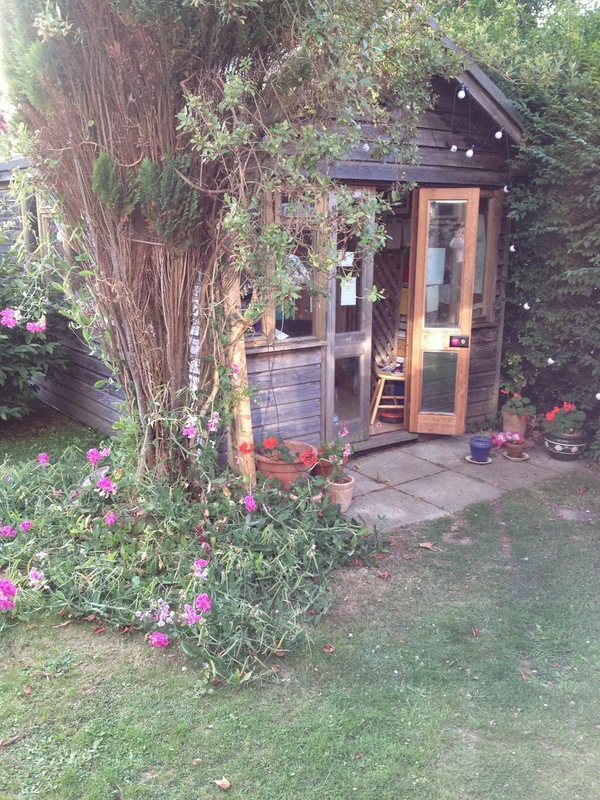 My dear friend Lizzie, the musician who wrote the piano music for AGD, has gone on tour again in America and has left me her cottage for the month of July. I aim to get there as soon as I can, for a little while, to think things through for AGD and what it all means now that I am no longer painting for it. Until then, it is probably not a good idea to ask my anxious Polish lodger to rustle up a three course meal for me, he doesn't know he filled the Staffing Dream briefly while mowing the lawn earlier. He wouldn't understand. I will just have to make some tea, put some veggie sausages in the oven, and give up for the day. This really will be good. I am on the ball here, and Gail and I intend to roll these out as often as we can. See you there. Exciting! Here I am with Eileen, on her last visit to Bognor, before she moves to Tanzania for three years. I am sitting on my sofa, and opposite me sits Eileen, drinking tea and staring out of the window. 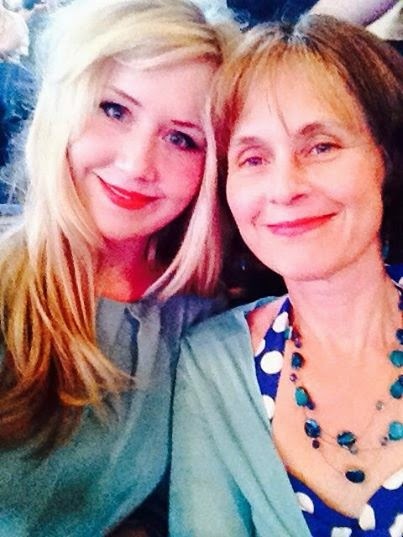 It strikes me that if she is leaving me I should stop doing the blog and talk to her. She has been so busy getting ready to emigrate, I wonder if a bit of nothing is a godsend to her, but I have not checked so maybe she is just polite and is very surprised, as I tap away at this blog, that our last hours together in this house are not more conversational. As I laid aside my laptop in order to chat with my dear old friend, Giant Boy came in to play the piano. Eileen and I are now only able to nod kindly to each other on our sofas through an explosion of piano and all the while, her departure date gets nearer. Ah well. Perhaps this is what life is about. We do not know what is around the corner. Neither of us knew that Giant Boy was going to do some furious and enthusiastic Rachmaninov while Eileen and I sit on our sofas for her last hour on her last visit here to Bognor before she moves to Africa. Eileen and I have no real need to talk anyway, we know what the other is thinking after all these years. And so I have taken up my laptop to continue the blog because I know Eileen is thinking that I should do so. I am going with her to the airport when she is flying out, so I do have one more afternoon with her, which I look forward to. It will be strange to leave the airport and know that she is no longer in the country, but probably not nearly as strange as Eileen will feel sitting on a plane flying to Africa where she will be living and working for the next few years. Since last week, when I was in a bit of a post exhibition trough, things have picked up. One of my lodgers told me I look calm these days. I wonder if she is mistaking calm for vacant, which I have been, since the exhibition ended. But now, the low is not so low, the down is not so down, and I am on the way back up to a happy and jolly medium. The poster for our next Conversations is below. Our Conversations event coming up, just for you. No waffling ha ha ha. As you can see, at last, I have found a venue for this session of our Conversations. I had a few nervous rebuffs from other people I approached, which shows how sensitive this subject can be. 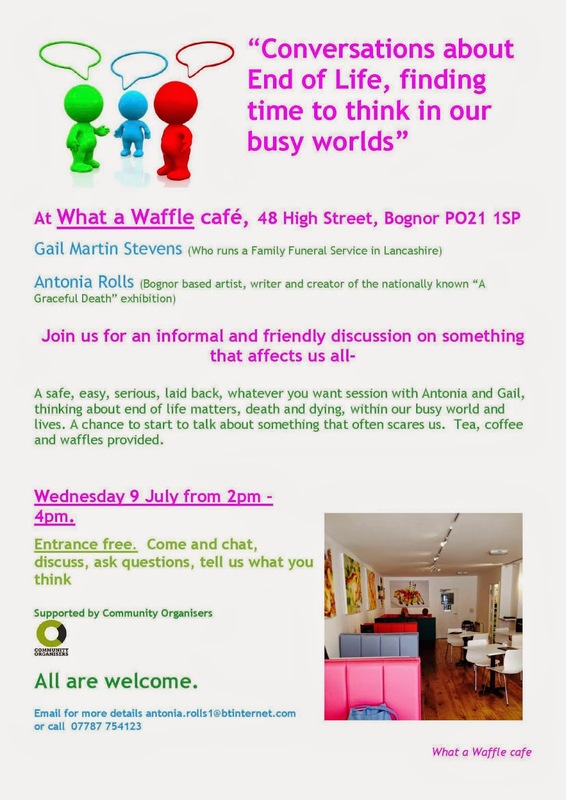 A very nice man here in Bognor called Richard, has recently opened a bright and airy Waffle and Ice Cream Parlour; just the place to chat about the dying. Val from Community Organisers (who is supporting and helping with this event) put me onto him, and I expected him to look pained when I cycled up to the shop to ask if Gail and I could chat about death in his cafe with strangers, but he didn't. Fine, he said. And so the venue was sorted. What a Waffle is a bright, colourful, American Diner type venue, so I think it will be perfect and, there will be waffles. Lots of waffles. Put the 9 July in your diaries, and come on down. Today, as the new lodger was moving in, Giant Boy decided to cook dinner. The kitchen is like a mad scientist's lab from an old black and white film while he is in there, and I wonder if the new lodger thinks this is normal. My new lodger, a charming, twinkling Liverpudlian Bouncer who reminds me of Ricky Gervais, has taken the tiniest room in the house. He arrived today with an X Box and no other discernible luggage. 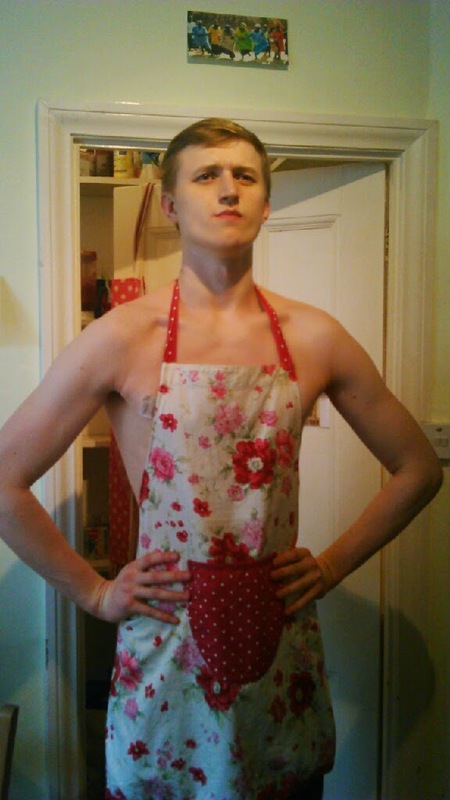 In the kitchen on his first day, was Giant Boy in an apron and a pair of trousers. Dear Giant Boy, the meal was wonderful and while we were eating it in my sitting room, (a noodle stew/soup with veg which we ate with forks which took a long time) my anxious Polish lodger cleaned up the entire kitchen for us. I wonder if the Bouncer thinks that is normal too. Either all my lodgers clean up after me and my boys, or just this anxious Polish man has been singled out for endless washing up. Whatever, I have eaten, the kitchen is cleaned, and when I last saw him, Giant Boy is still wearing the apron. My new lodger seems to have gone out, and has not come back. He may be in a hotel nearby phoning for a courier to come and collect his X Box asap. This week another dear friend comes to stay, Sam from Ooop North. Sam ran a care home for years, became utterly exhausted, and gave up. She has lost four stone since we last saw each other, so leaving work seems to have been the right move. There will be much to catch up on, and so much to say. Sam put together a wonderful programme of training for care homes called Soul Carers, which goes very well with A Graceful Death. Now that she is not at the care home any more, and may have more time, I think she should take on lots of work with A Graceful Death and very happy about it. I think she should long to do all the difficult stuff like organising, PR, finance and admin. I shall put it to her and wait for her to thank me with tears in her eyes. Actually, there is much that Soul Carers and AGD can do together, I will see what she says. She calls a spade a spade, so will tell me quite quickly to get knotted if she thinks it is not a good idea. 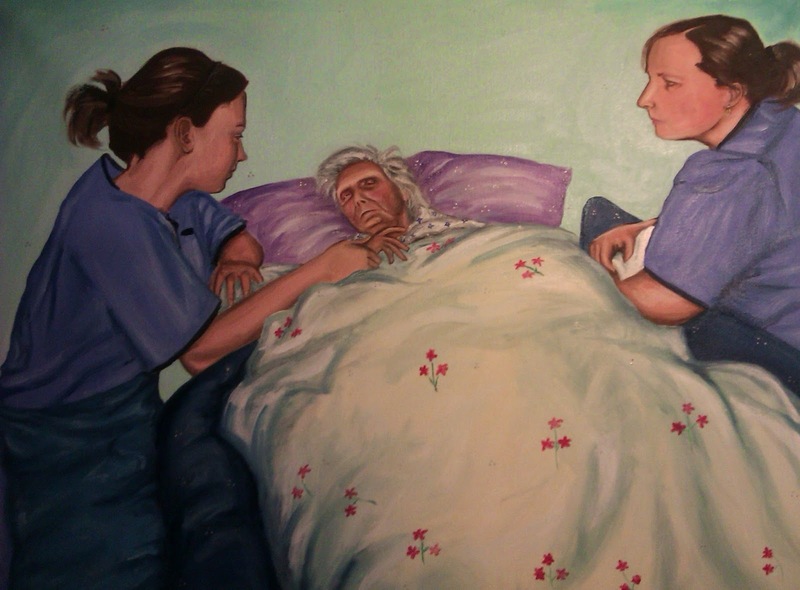 Sam requested this painting be done, of the wonderful way she trained her staff to sit with the dying at any time of day or night at the care home. Winnie here is dying but it is the relationship between the two carers that is so lovely. The carer on the right is training the carer on the left to vigil. I have had a new lodger move in today, I have waved the last one on her merry way back to Poland for an operation on her leg. I saw on Facebook that she stopped off in Brighton to go to a Rod Stewart concert first, and wonder if her leg mysteriously improved for the evening. Other Son, my rather enigmatic and fashionable older son is here but does not like to communicate facts, so I have to guess how long he is staying and why. Giant Boy is walking around in trousers and a flowery apron making bad jokes to the foreign lodgers who think he is being serious. On top of all this, I am making my daughter's wedding invitations. We, Fancy Girl, her friends and I, are setting up a factory on my dining room table where we will churn out the most amazing hand made wedding invites, RSVP cards, and wedding direction/information cards. There will be lace, there will be brown card, and there will be tartan. Say no more. I have promised to give them vegetarian scotch eggs and coleslaw with home made garlic mayonnaise as a treat, so I have special dispensation to go into the kitchen and cook. I expect there will be lots of cake too, but I shall buy them from Sainsburys. On lying under a peony and dribbling. I heard a review of a book on radio 4 recently where the narrator rambles on in a stream of consciousness, while obsessing about and giving endless details of trivial things. I shall base this week's blog on that author's style. Or not. I shall resist but that is how it may turn out. The best thing to do this week is to ask questions, and to answer them. Let us, then, begin. Question one. 1. What is the matter with you that you may need to ramble and obsess? Nothing is the matter, I am in the empty space after being very busy and full of focus. This is the down after the up, the low after the high. Working on the A Graceful Death exhibition takes an awful lot of work and concentration, and during the actual exhibition, I do 14 hour days. Fine. Love it. When it was over, I came home, I had the house to clean and reclaim from my dear lodgers and Giant Boy. There was a small metric ton of laundry to do, food to buy, plates to remove from under the bath and so on. The exhibition needed to be unpacked, re-catalogued, and repacked. All that kind of thing is a lovely buffer zone between being extremely busy in the run up to and during the exhibition, and having nothing to do at all after the whole thing is over. And now, today, I have nothing more to do. I am sitting here on my sofa, and what I do next, is entirely up to me. Warm up my own body weight in Cadbury's dairy milk chocolate and spend fourteen hours eating it. Organise the next big AGD here in Chichester and make the speakers, for this event, writers and carers. Paint the portrait of someone who is facing the end of life, write up their story with them, and let them keep it all. Produce a play - or a read through - for AGD. The late Sue Eckstein's play "The Tuesday Group" is the one I want. Sue died recently, and I feel bad because she said I could use her play, but I felt very daunted and let it slide. Her death recently made me understand that you just never know what is going to happen. Now, I tell myself, is often a very good time. Find a venue for the "Conversations about the End of Life, finding time to think in our busy worlds". I am looking to do this in Bognor. And everywhere. If you have a venue, let me know. I'll bring the cakes. Put Cornish clotted cream on the Dairy Milk above and lie in it. 4. I see. And tomorrow? Tomorrow, they say, is a whole other country. I do have a plan for tomorrow, it just feels as if I am going to ignore it. I am the mistress of my own destiny, I say, probably to no avail. It is possible that my plan for tomorrow will peter out and I will stare quietly into space and dribble. Should I be capable, here is my plan. Finish a really lovely portrait of an old couple sitting in their garden. I have done the people, it is now time to put a tabby cat on the lady's lap, and add books, newspapers, pens, pencils and some African sculptures from their life in Africa, to describe who they are. This means sitting in my studio in the sunshine, with a pot of tea. I think I can do that. Tomorrow is the day I have set aside too, to find a venue for the Conversations. I have no idea where to find one. I thought of lying on my sofa and willing someone to phone me up offering a nice central venue and waiving the fee because I am so wonderful. As yet, that approach has never worked. The unfinished painting, the hard stuff is done, now it's just cats and books and African sculptures. The normal stuff of life. 5. What, then, is your conclusion? My conclusion is that I am very tired. I am not needing to sleep, I am needing to day dream. I am needing to give myself mental space, and to let all these ideas dance in my mind without trying to organise them. I do have more AGD events towards the end of this year, at an event in Ascot in the last weekend of September, and in Swansea at the end of October and the beginning of November, but that is a long time away, and I don't need to think about it now. I don't need to think of anything at the moment, I just need to drift and dribble, as they say. Oh, I have such hopes for the A Graceful Death exhibition and project. I have so many exciting things to do, and so many projects to set up. But right now it is time to visit, as my cousin Maddy says, La La Land where the very act of lying down in the garden under the peonies is good for the soul. It is at times of weariness when doubts creep into one's mind, when one feels as if one should do more not less, it is at times like this that one needs to step aside and be kind, very kind, to oneself. Being in the low after the high, the down after the up, tends to make us bully ourselves a bit. We blame ourselves for feeling empty, and for not having lots of things to do, for not continuing in the same productive and energetic way of last week. But all things are cyclical, and all things wind down before starting up again. This time in the cycle when all that needed to be done, is done, is very precious and very prone to being misunderstood. Standing still after moving fast feels wrong. but it isn't. It is just sensible before starting up again. So that is where I am now. Standing still. In a precious moment. Understanding that this part of the cycle is just as good and important as the busy one. And on that happy note, I am going to find a peony, lie under it and eat some chocolate. My lovely studio. There are peonies, somewhere else in the garden, but I am not really fussy. I can lie down under these sweet peas and eat chocolate. I can lie down anywhere and eat chocolate. Oh What a Week That Was! A Graceful Death in Preston Park, Brighton. The exhibition was fabulous. The exhibition is over. A week has passed since I packed up the paintings, put the church back, and drove myself wearily but happily home from Preston Park in Brighton, all the way down the A27 to Bognor Regis, and home. Vicky, a lovely and excellent AGD Brighton Setting-Up elf, setting up. Vicky runs community arts projects in Bognor and is in huge demand so I am very lucky to have kidnapped her for the day and given her an exhibition to set up. Thank you Vicky Hulatt. It took the whole of Monday with the help of Vicky, my daughter Lexi, and Storyteller and Soul Midwife Jade Parsonage-Buck. By Monday night, the whole church had been remodelled and turned into an exhibition space for the A Graceful Death exhibition. It was absolutely wonderful. The paintings, the stories, the poems, the films were set up in this glorious old Heritage church, without touching any of the walls (we used chairs, tables, easels, gravity etc. The walls were fragile and could not be touched by anything), and the exhibition took on a grandeur and dignity which reflected the church entirely. Outside, we decorated four of the church's A boards in pink and red bunting, and we hung the festive colourful plastic flags one gets with party poppers for kiddies parties from Sainsbury's, in the trees and railings, so that the church, which was well hidden from the road, could be found. On Tuesday, at 10am, we opened. On Tuesday at 10.10am our first visitors came. On Tuesday at 10.15 our first visitors left. They wanted to see the church and didn't know there was an exhibition on. 10.01 on Tuesday 20 May, the exhibition is informally opened by me. Team AGD Brighton hosted, with aplomb, an opening night that could have gone either up, or down. Of course it went up. Many people came, including my old friends the South Korean film crew. They got very lost, and I had to go and stand in the road to help them find the church. This became quite a theme, many people went to a number of other churches in Brighton and wondered why I had lied about there being an AGD exhibition on. Many times I had to go and stand in the road and wave people into the little track that lead from Preston Drove up to the church. The exhibition was formally opened by Glynn Jones, Chair to the Friends of Brighton and Hove Hospitals and Deputy Lord Lieutenant of East Sussex. A most delightful, interesting and beautifully dressed man, I liked him very much indeed. The Friends of Sussex Hospitals provided a bar, and took all the worry of providing drinks and nibbles away from us. Documentary film maker Clare Sturges came all the way from Cardiff for the day which was wonderful. Clare is working on a documentary film on Soul Midwifery, and is an engaging, intelligent and lovely person, it was really good to see her again. Sarah Stone from Dying Matters came along, and Rosie Brown from Ehospice magazine came too. We were also very happy to welcome Colin Matthews, Vice Chair of the Brighton Fringe Festival. There were professionals and friends, those working in the palliative care field, and those having a passionate interest in it, all coming to support us on our opening night party. AGD Team Member Rev Canon Peter Wells on the right welcoming people, as they arrive for the Opening Night event. The South Korean film crew are in the background. I stand in the middle with my Shoot an Arrow at me I'm a Target dress on. Day two opened. Day one had seen visitors during the day, some intending to come, and some not. Some had tracked us down as we were part of the Dying Matters Awareness Week and the Brighton Fringe Festival, and others had read about a nice ancient church in Preston Park and had ambled along to have a look at it's ancientness. Most of them stayed and were very moved by the exhibition, a few ignored it completely and took photos of the ceiling and floor and asked us what we had done to the church. The church, I said, has transformed itself for this week into an exhibition on what it means to die. What is the end of life, and what does it mean to die? Eeeek, they said and fled. Wednesday saw our first event, a guided presentation and public discussion on Preparing for Dying. It was the first of our sessions, and people trickled in tentatively. We had about half the people we had hoped for. Our speakers for this session were Eleanor Langridge, Dementia Speaker on end of life care, Rev Canon Peter Wells Senior Chaplain at BSUH and Rachel Reed from St Barnabas Hospice in Worthing. Alan Bedford, former NHS Chief Exec and non exec Director of the Martets Hospice was in the chair. It was a moving, thoughtful and fascinating session. Everyone attending learned much about planning for dying, and listened to some very experienced professionals, . Thursday's event Supporting the Dying had a good many attending and by Friday, the Communicating with the Dying and Working with the Dying events were very full indeed. I cannot thank our speakers enough for their time, their insights, their intelligence and their support of the A Graceful Death week. Thanks to Team AGD Brighton, thanks to Nigel Spencer, Peter Wells and Rachel Reed, we were fortunate to have consultants, doctors and chaplains from the Martlets Hospice in Hove, St Catherines Hospice in Crawley, St Barnabas Hospice in Worthing, Brighton and Sussex University Hospitals and Brighton and Sussex Medical School. Nigel, Peter and Rachel work within the hospitals and hospices, and arranged the talks and the speakers to reflect some very important topics. Planning, supporting, communicating and working with the dying. They also arranged an entertaining and amazing Early Evening Salon on the Art of Dying, Ars Moriendi, on the Thursday at 6pm. We were treated to a wonderful talk by Rev Robert Easton, Chaplain to Brighton College, on the mediaeval woodcuts that were a sensation then, and from then on until the last century, showing us how to prepare for a true and Christian death. And, we were entertained by some clever and witty cartoons created by and used for teaching by a Consultant in Elderly Medicine at BSUH, Dr Muna AlJawad. And on the Wednesday evening, Nigel held an excellent Dementia Information Session. Thursday's session, Supporting the Dying with, standing, Team AGD Brighton member and Palliative Care Nurse Practitioner from St Catherine's Hospice Crawley Nigel Spencer, Chair Professor Bobbie Farsides from BSMS, Consultant Dr Mark Bayliss from BSMS, and Consultant Dr Simone Ali from Martlets Hospice in Hove. Friday's session on Communicating with the Dying. Left to right, chaired by Professor Bobbie Farsides from BSMS, with Chaplain Dawn Allen from the Martlets Hospice, Consultant Cathy Gleeson from St Catherine's Hospice Crawley and Consultant Rose Turner also from the Martlets Hospice. One man came into the exhibition and spent a long time looking at everything. On his way out, he told me he had cancer, and I saw that he was indeed not very well. He said that he felt kinder to people on his way out of the exhibition than he did on the way in. At each AGD, there is one person for whom I say, this is the reason the exhibition is showing in this location. My friend here was that person for this exhibition. He was smiling as he left, and I felt as I often do while showing AGD, taken out of myself and given a gift from a stranger that could, if I received it correctly, enhance my understanding of life. I spoke with many people. I spoke with a man who said he had prepared himself as best he could for his death, including telling his children (all grown and living independently) which was not easy but was a very good move. He had heart trouble and knew that he could go at any moment, any day. This man was nearly 80, energetic, strong willed and full of life. I liked him very much. He brought his wife along the next day, and I was impressed because I don't think it was an easy place for her to come to. They did not stay long. Perhaps the best story for this week was a group of school children who arrived in the late afternoon on Monday when we were setting up. They were 14 years old. One fellow came up to me with his friend and told me the exhibition was a celebration of life. I congratulated him on his perception, and listened as they talked amongst themselves about painting the dying and what it looked like to them. All the kids read the poetry and asked questions about the people in the painting, and agreed that it was not a spooky exhibition, but it was quite sad. They left to have a smoke. When Lexi looked in the book for comments and thoughts, one of them had written, "I am not scared of dying any more. Name aged 14"
The lad who told me it was a celebration of life returned twice to the exhibition, and sat while people viewed the paintings and writings. He listened to the films and interviews on the TV screen and laptop provided. I offered him a rock bun towards the end of the week, (Nigel provides the most extraordinarily good rock buns) and asked him why he kept coming back. He didn't know, he said. He just understood it. I wonder now if he had experienced some kind of loss, and had not finished processing it. He was such a quiet, perceptive and wise youngster. He did not want to speak much, and he left on the Friday afternoon and did not come back again. He took my card. I said if his parents allowed it, I would like to speak to him about what he understood in the exhibition. I have not heard back from him, I don't suppose I will. A full, exhausting, uplifting, affirming, sad, loving week. I worked 14 hour days with the help of Lexi, Nigel, Peter and Rachel, all of whom had full time jobs to attend to as well as doing AGD with me. I met a lady who had lost her husband many years ago, and looked around without her glasses first. Then she came back with her glasses and cried. We talked and she was fine, it was the remembering and the details in the paintings and the words that had struck a chord with her. An American lady came to the Opening Night and returned each day for all of the sessions. She was interesting and felt inspired to work with the dying somehow. She will do so, she was a smart and focussed lady, and was putting all her plans into place to learn as much as she could. By the end of the week, she had already got herself an interview to volunteer at a local hospice. These are some of the people that make everything worthwhile. I meet people, hear a little of their lives, listen to what has been their particular story, and I wonder at the resilience of human nature. Some people carry around the saddest of stories, some people don't. But they all keep going, and those that turn up at the A Graceful Death exhibition are my teachers. I have loved showing in Brighton. I have loved meeting everyone, and I have loved the hearts and souls in the people, the characters, and the drifters that float into my line of vision so briefly in the exhibition, and out again. I particularly loved the group of tiny school children dressed up as Victorians who were brought into the church by their teachers, also in Victorian costume (I think they were doing some history work at Preston Manor next to us). I stopped the teachers at the entrance to explain that it was an exhibition of the end of life, and all credit to them, they said it was fine, they just wanted to see the church. It would have been too late anyway, the Victorian tots were in the exhibition anyway, gaping at the pictures and skipping around pointing at the most graphic of the paintings with whoops of pleasure. The teachers looked around, paid attention, and left with all their jolly little olden days school kids all clutching literature on painting the dying and interviewing them to show their mummies and daddies. Aha! Here we are, Team AGD Brighton. 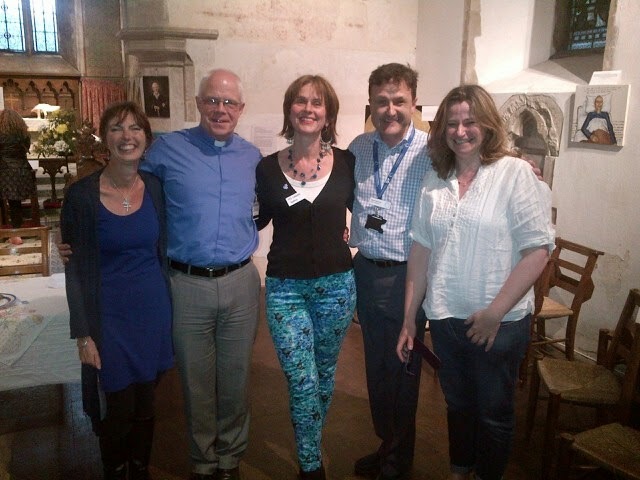 Left to right, Mandy Preece, Soul Midwife, Peter Wells, me, Nigel Spencer and Rachel Reed. Perfick. And here is the final photo of the week. After the final closing thoughts and meditations on the exhibition on Friday night from Peter, Lexi and I made our presence known. Again. Lexi and me as the last visitors leave to go home. I was asleep in my dinner within half an hour of this photo. Alan took me out for a celebratory dinner and by pudding, I was barely able to keep my eyes open. A week later, I am still tired, but so proud of the exhibition, the people who put it on, the speakers who gave their time and expertise, and to you, the public who came and took part. Next stop, Swansea in late October and early November.